Collectable Animal Carvings and Free Form Mineral Sculptures: hand carved horses, dolphins, turtles, frogs, chamelions, elephants and more! 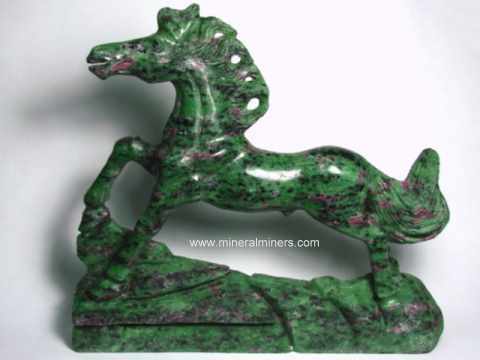 Try our Handcrafted Animal Carvings & Free Form Mineral Sculptures Satisfaction Guarantee - compare our prices and our superior quality. Click on any hand carved mineral carving or sculpture image below to enlarge it. This natural color jade buddha weighs 1.3 Lbs! This large size "laughing" buddha with pendulous earlobes was hand-carved from a single solid piece of genuine nephrite jade that was mined in British Columbia, Canada. This genuine jade buddha is natural jade - it has not been heated or treated in any way. Laughing jade buddhas are said to bring good luck and good fortune! Our Mineral Carvings & Sculptures were all hand-carved from Natural Minerals! See also our page displaying quartz crystal carvings, and our page with jasper carvings & jasper free form sculptures. We also have a selection natural quartz crystal gemstones and crystal balls. Would you like us to inform you when we add on this page more hand crafted animal carvings and free form mineral sculptures? We literally have tons of natural mineral items in stock at our mineral warehouses, so be sure to let us know if you have any special requests. Please contact our webmaster or our 'site' geologist with any questions or comments.